The members of the Galena shot put and discus squad are, top row, from left, coach Ben Blasco, Koby Wightman, and Joshua Felarca; bottom row, from left, Chiara Demientieff, Isaak Larson, and John Riddle III. Photo by Aaron Susook. 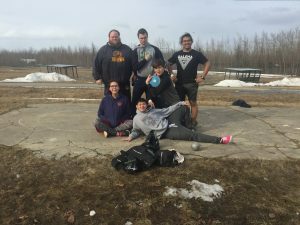 A new sport has commenced in Galena this year, thanks to SHS student Koby Wightman and residence life director Ben Blasco. The new sport is a track and field event called shotput, which is hosted in the Olympics. The Galena shotput team will compete at the state track and field championships in Palmer on the May 25-26. The team consists of students John Riddle, Koby Wightman, Chiara Demientieff, Joshua Felarca, and Isaak Larson. The head coach is Ben Blasco and the assistant coach is Jeremy Havener. For many of the students on the team, this is a new experience for them. “We do this sport because it’s different, with good people and it makes us swole,” said John Riddle. (“Swole” is an informal word meaning “muscular.”) According to John, he also does it for a good workout, and it helps him prepare to play post in basketball next year. Koby is the only student on the team that has past experience with this sport. “The shot is performed by throwing a 12 pound ball that is put, not thrown,” said Koby, a junior from Galena. Coach Blasco had plenty of experience with shotput when he was in college. He threw in college during all four years and coached other athletes for two years. The team spends a majority of their time pumping iron in the weight room and practicing their form for shotput on a concrete slab beside the GILA dining hall. Because for many of the Galena shot putters this is their first year doing this sport, none of them have personal records for the sport because they have not officially competed before, said coach Blasco.